An ELO is a credit-bearing learning experience outside the classroom. It starts with competencies and a student’s interests. A quality ELO is different from a simple internship or online course because it is competency-based, not hours-based. The NH Department of Education supports school districts to encourage extended learning opportunities. Section 306.27(b) of the NH Minimum Standards for School Approval addresses the minimum standards for extended learning opportunities, including what the school board policy should cover. 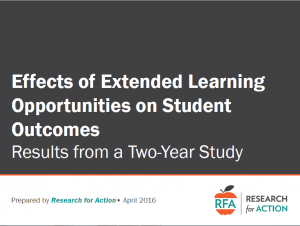 Research for Action (RFA) conducted a two-year study on ELOs (PDF, 34 slides, 2016) in New Hampshire. How does the quality of implementation at the school level influence student participation in ELOs? What are the effects of ELO participation on short-term and longer-term student outcomes? New Hampshire legislation allowing for credit-bearing learning outside the classroom dates back to 2005. In 2008, the NH Department of Education began a multi-year ELO Initiative with funding from the Nellie Mae Education Foundation (NMEF). The initiative provided financial support and technical assistance to ELO pilot sites, facilitating development of school-level systems to provide students of all types with the opportunity to experience an ELO project. Are you a teacher ready to try an ELO for an individual student, but your school does not yet offer ELOs? You can begin with an ELO tied to one of your classes by going to the Individual ELO Design page. Or, try the free online ELO short course. Is your school is ready to design an ELO program? Begin with the ELO Program Design page. Are you a student exploring your interest in an ELO? Look at the For Students page to answer your questions and see some ELO examples. Click on “Present” to begin a visual tour of ELOs that covers the conceptual framework, an overview of tools, and how to get started.